We started out our day with another GORGEOUS day of driving. I will never get tired of the amazing views here. There doesn’t appear to be any tolls to pay! But we will catch a Ferry in Vangsnes to Dragsvik Ferries seem to run every 45-55 minutes. VOSS: I highly suggest going to the Visit Voss site and downloading their FREE visitor guide. You can download it in Norwegian, English and German. 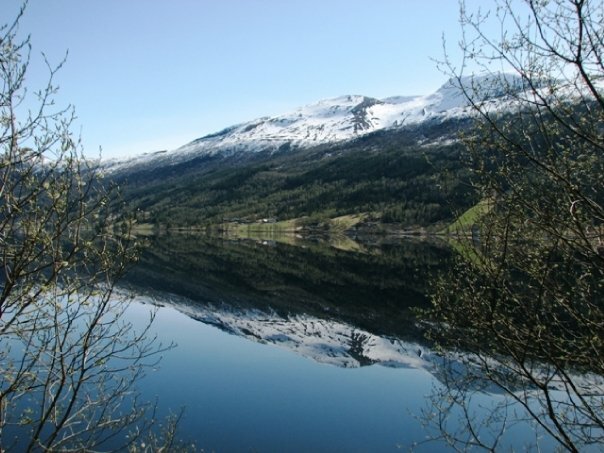 Between two fjords, Voss is a famous year-round resort, also known for its folklore. It was the birthplace of the American football hero Knute Rockne. St. Olav’s Cross – believed to have been raised when the townspeople adopted Christianity in 1023. Cable Car: panoramic views of Voss and its environs. The mountaintop restaurant serves refreshments and meals. Round trip ride costs 60 NOKS. Finnesloftet – one of the oldest timbered houses in Norway, dating from the mid-13th century. 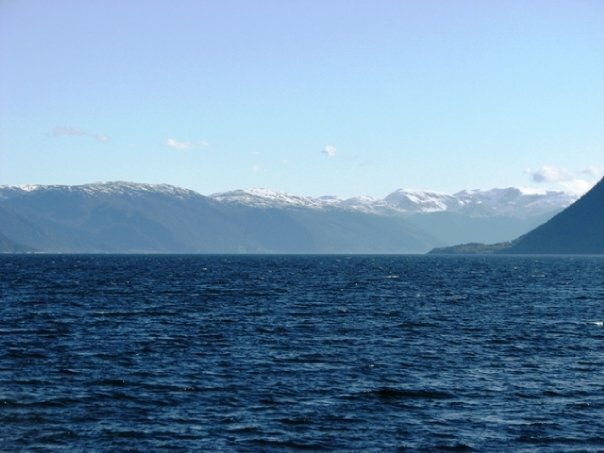 It’s located about 1.5 km west of Voss. Vangskyrkje – this 1277 church with a timbered tower contains a striking Renaissance pulpit, a stone altar and tiptych, fine woodcarvings and a painted ceiling. It’s in the center of Voss. 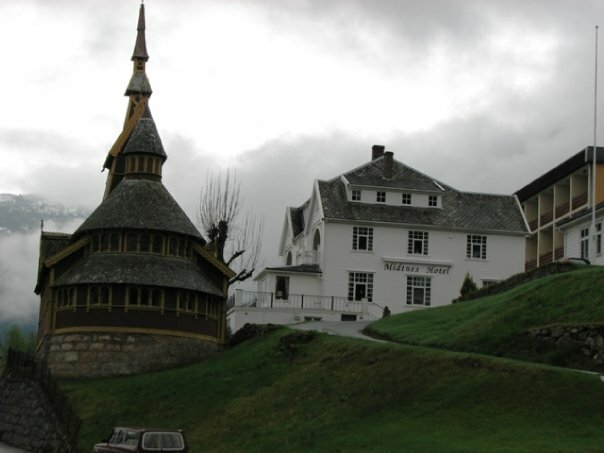 Folkemusem – about 1 km north of Voss on a hillside overlooking the town, this museum consists of more than a dozen farmhouses and other buildings dating from the 1500’s to around 1870. 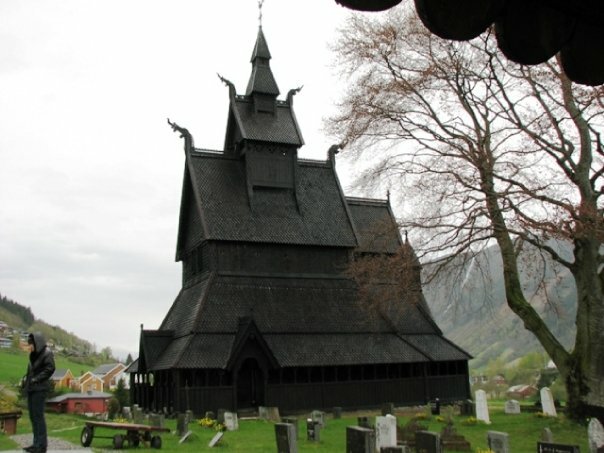 Hopperstad Stave Church (Hopperstad Stavkyrkje) — the most accessible stave church in the area is located across the Sognefjord, in the town of Vik. Hopperstad Stave Church boasts an extremely scenic exterior, with several tiers of dragon heads overlooking rolling fields between fjord cliffs. The interior is notable for its emptiness — in a good way. Instead of being crammed full of later additions, the church is blissfully uncluttered, as it was when they built it in the mid-12th century (45 kr, good 29-kr color booklet in English, daily mid-June–mid-Aug 9:00–19:00, mid-May–mid-June and mid-Aug–mid-Sept 10:00–17:00, tel. 57 69 52 70). The church is located a gradually uphill 20-minute walk from Vik's harbor. From the boat landing, walk up the main street from the harbor about 200 yards (past the TI, a grocery store, and hotel). Take a right at the sign for Hopperstad Stavkyrkje, walk 10 minutes, and you'll see the church perched on a small hill in the distance. This is an AMAZING church!! From Rick Steve's website: This pleasant fjordside village (pop. 1,850) is away from the Norway in a Nutshell crowd. From here you can side-trip to nearby Fjærland (a.k.a. "Mundal") and the awesome Jostedal glacier. Consider this worthwhile detour to the typical fjord visit — so you can dig deeper into the Sognefjord, just like the glaciers did during the last Ice Age. At the Tourist Informaioin located next to the Spar grocery at the harbor, pick up the free, helpful Balestrand Map. If you're planning on a longer hike, consider buying the good 70-kr hiking map. 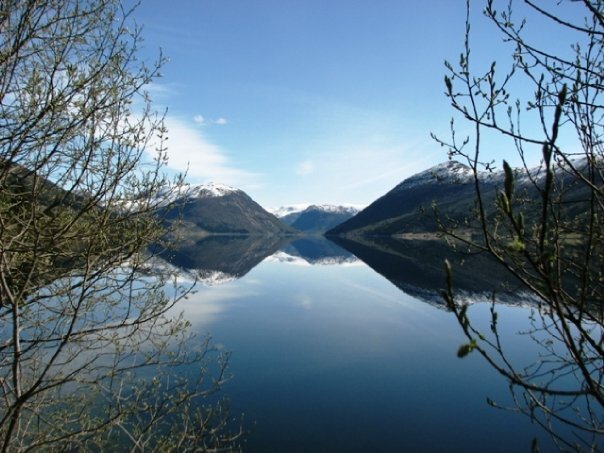 The TI has numerous brochures about the Sognefjord area and detailed information on the more challenging hikes. It offers Internet access, rents bikes (30 kr/hr, 75 kr/half-day, 140 kr/day), sells day-trip excursions to the glacier, and more (late-June–Aug Mon–Sat 7:30–18:00, Sun 10:00–15:00, shorter hours in spring and fall, closed Sept–April, tel. 57 69 12 55). 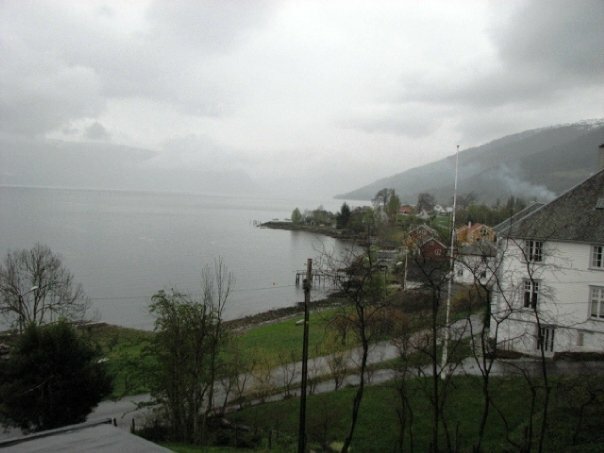 The "old road" — once the main road from the harbor — follows along the fjord's edge, passing numerous "villas" from the late 1800s. These were built in the popular Swiss style of the period by locals attempting to introduce a dose of Romanticism into Norwegian architecture. Look for the dragons' heads (copied from Viking-age stave churches) decorating the gables. Along the walk, you'll see two burial mounds from the Viking age, marked by a ponderous statue of a Viking king. Check out the wooden shelters for the postboxes; some give the elevation (m.o.h. stands for "meters over havet" — the sea — not too high, are they?). 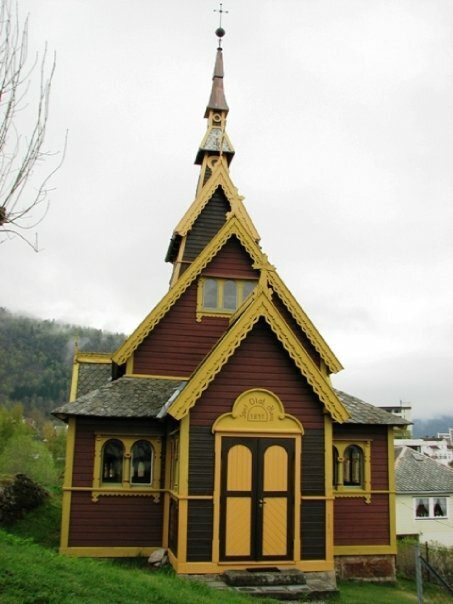 St. Olaf's Church — this distinctive wooden church was built in 1897 by the wife of Knut Kvikne (of the Kvikne's Hotel family). This devout Englishwoman wanted a church in Balestrand where English services were held...and indeed they still are, by British clergy in summer (free, open daily, services in English every Sun late May–Aug). The Golden House (Det Gylne Hus) — this golden-colored house, at the corner of the waterfront scene (left from the boat dock), houses an array of diversions and a good restaurant. A local watercolorist and historian, Bjørg Bjøberg, and her husband, Arthur Adamson, rescued this fine old building and are turning it into a time capsule of Balestrand's past. On the ground floor, you'll find Bjørg's gallery, with watercolors celebrating the beauty of Norway. Upstairs is a free exhibit of historical artifacts from the town. What began as an informal collection of old general-store items found in the attic was gradually added on to by locals wanting to preserve treasures from their own families' past — making this an organically-grown town heritage museum (free entry, May-Aug daily 10:00–22:00, slightly shorter hours late April and Sept, closed Oct-mid-April — but call ahead and they might be able to let you in, tel. 91 56 28 42.) If you're intrigued by the Golden House, note that you can also hire Bjørg to take you on a guided town walk, or pay 20 kr to watch her film about art, life, and nature (shown in a little room hidden upstairs, in the middle of the exhibit). Aquarium — the tiny aquarium gives you a good look at marine life in the Sognefjord. There are no English descriptions in the exhibit, but you can borrow an English brochure at the front desk. While not thrilling, the well-explained place is a decent rainy-day option. A 15-minute slideshow starts at the top of each hour. At the end, enjoy the wood-carvings depicting traditional everyday life in the fjordside village of Munken (70 kr, mid-June–mid-Aug daily 9:00–23:30, early June and late Aug daily 10:00–17:00, closed Sept-May, tel. 57 69 13 03). Be sure to check out the tanks on the dock outside, which are sometimes filled with live fish. You can fill your tank at Café Fløyfisken, the aquarium's cheery restaurant. Biking — You can cycle around town, or go farther by circling the little but extremely scenic Esefjord (north of town, en route to the ferry landing at Dragsvik — about 6 miles each way). The roads here are relatively flat. Bike rentals are available from the TI and, for guests, at some hotels. Kviknes Hotel – We are not staying here but the book “1000 Places to See Before You Die” recommends this hotel so we’re planning on at least looking at it. It says “You’ll see the rambling Victorian carved-wood frame of Kvikne’s Hotel on a small peninsula jutting into the 127 mile long fjord. Dating back to 1752, the hotel has been the destination of poets and monarchs for the four generations that the Kvikne family has been at the helm. 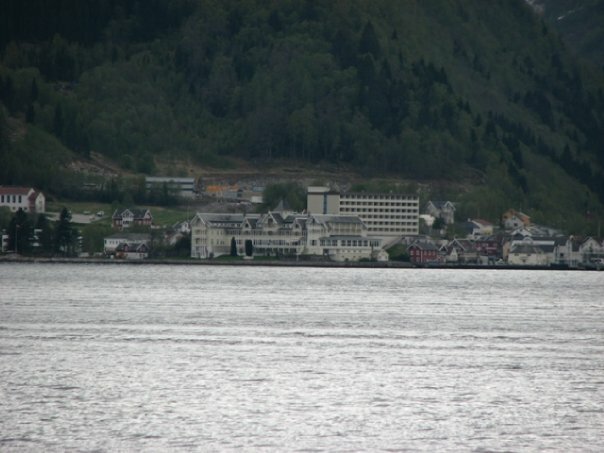 Here is a view of the hotel from across the water. We did walk into the hotel, they have a shop so anyone can walk in. Breheimsenteret is a National Park Visitor's Center at the entrance of the Jostedal Glacier National Park. 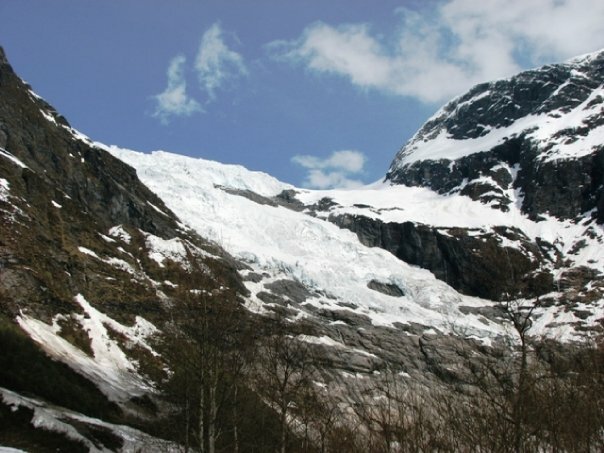 The glacier and the park have their names from the Jostedalen Valley. 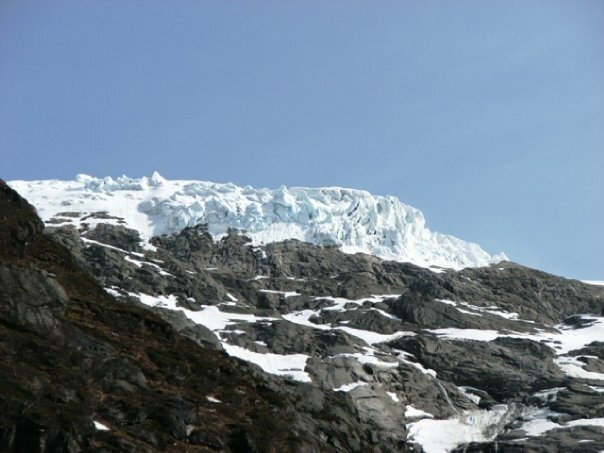 The Nigard Glacier is the easiest accessible arm of the main glacier. A new National Park has been established on the eastern side of the Jostedal valley since we were there. This park is called Breheimen National Park. That means that Jostedalen will be a long, narrow valley between two wonderful national parks. The Visitor's Center has a museum that was pretty cool. 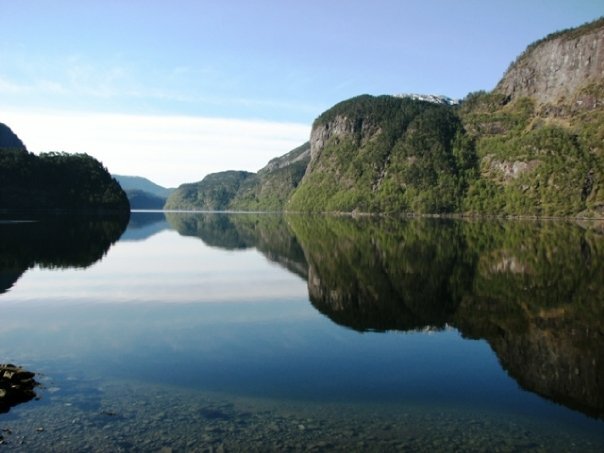 They also do all of the bookings for the Jostedal activities such as glacier hiking, glacier lake kayaking, and rafting in the Jostedal river, They also have a souvenirs shop, with sweaters, jackets, T-shirts and postcards. And of course general tourist information for the Sognefjord region. They have a restaurant with a Children's Climbing Room, within the cafeteria. They also have free Wi-Fi. We got some AMAZING views of the glaciers while here. Feel free to check out the rest of the amazing pictures my husband took on the way to Balestrand.